If you in any way, shape or form like salmon or salmon patties, you will love this grilled twist on a classic. Fresh salmon is key. This is not your ordinary canned salmon patty. Finely chopped fresh salmon combined with panko bread crumbs, peppers, garlic and fresh dill make this recipe a treat. 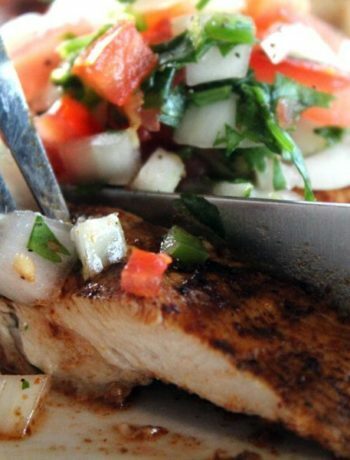 Grilled Fresh Salmon Patties…one word. Amazing. This salmon was not caught off the banks of the Tennessee River. 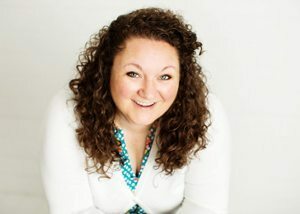 BUT…it is as fresh as this gal can get. Not canned. Not smoked. Don’t get me wrong, I love salmon patties made from quality canned salmon. It reminds me of meals we had when I was growing up. You know, the classic: canned salmon, egg, cornmeal, etc. That’s actually what brought this idea to life. Serve these salmon patties with country classics like mashed potatoes and black-eyed peas. Or, lighten up the meal and serve with a fresh salad. Aren’t they so pretty? If you are into sushi (and I am) you might be tempted to eat these just like this (and I was). But I didn’t…because egg. Form the mixture into patties then chill in the refrigerator for ATLEAST an hour. You want the salmon patties to firm up and bind together before you put them on the hot grill. Don’t wanna grill? No worries. These will cook nicely in a hot skillet. 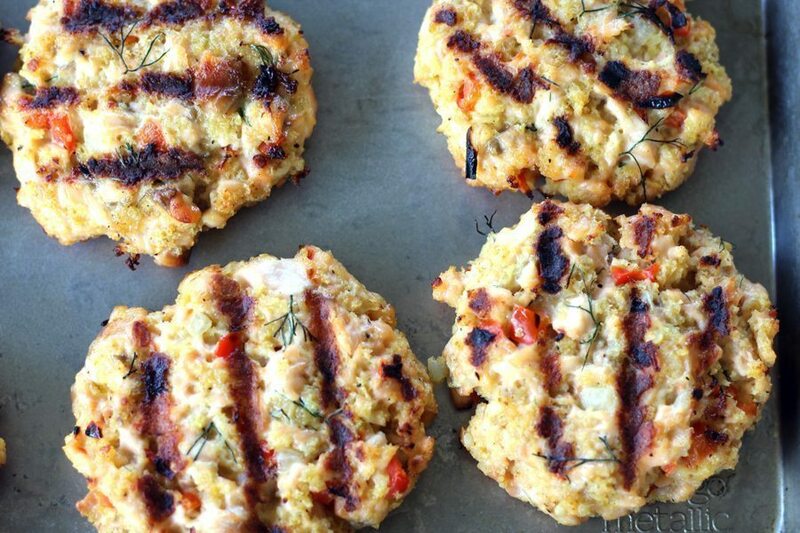 GRILLING TIP #1: Make sure your grill is CLEAN and OILED before cooking these salmon patties. GRILLING TIP #3: Brush both sides of the chilled salmon patties lightly with olive oil just before you put them on the grill. Once you put the patties on the grill, DO NOT touch them for 4 to 5 minutes. Then the patties will easily release from the grill. Flip, then cook another 4 minutes until done. 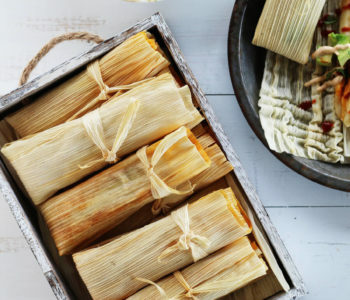 These look (and taste) delicious! Plus, they are pretty low carb and make a yummy lunch, too. 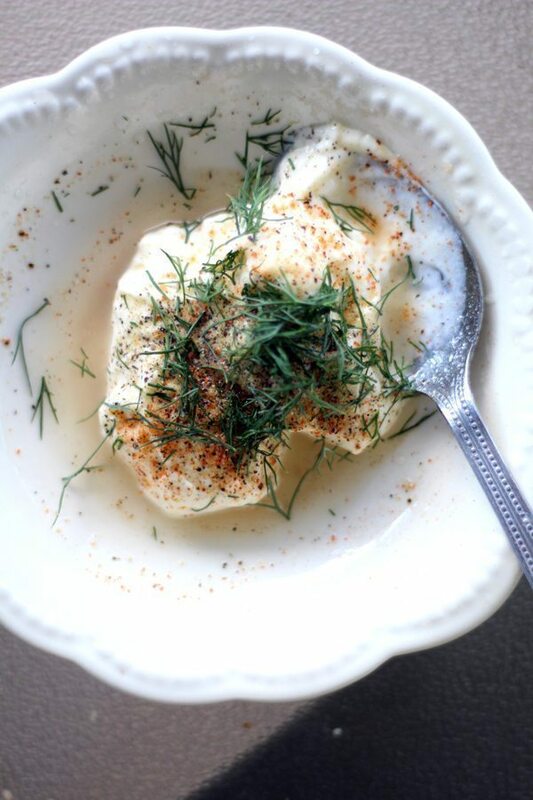 Serve with this quick Lemon Dill Mayo for even more yummy flavor. As always, we use Duke’s mayonnaise for the best flavor. 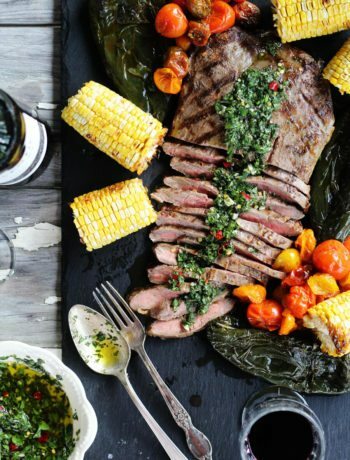 Tell us about something different you have grilled lately? We’d love to hear from you. 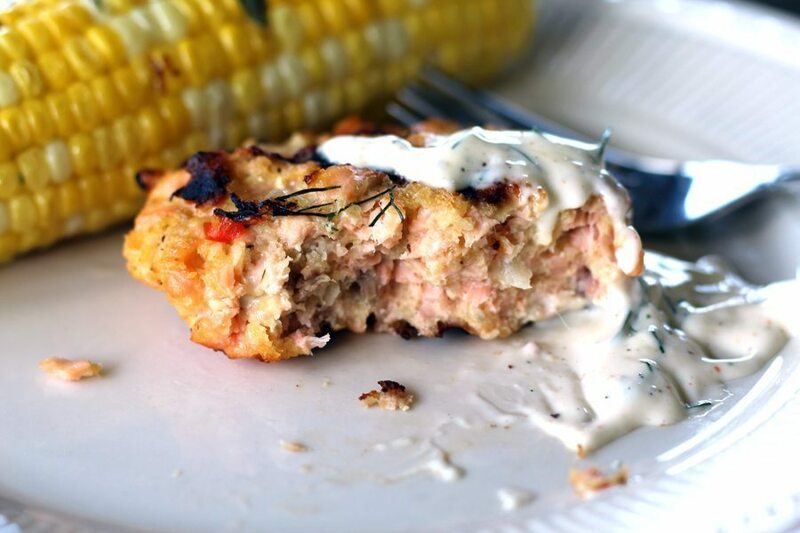 A fresh and fun take on the classic salmon pattie recipe. We used fresh chopped salmon with bell peppers, dill and more to create a grilled salmon pattie. Served with a zesty lemon dill mayo. In a small skillet, heat 1 teaspoon of olive oil. 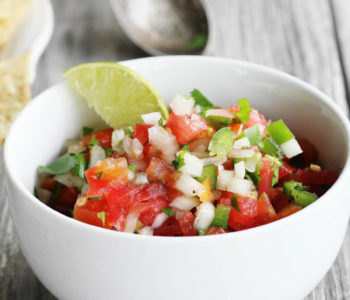 Cook the garlic, red bell pepper and onion for 5 minutes or until tender. Set aside and let cool. 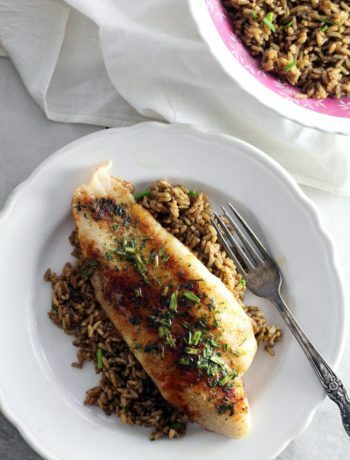 Remove skin from the salmon filet if needed. Finely chop the salmon until it resembles the consistency of hamburger meat. 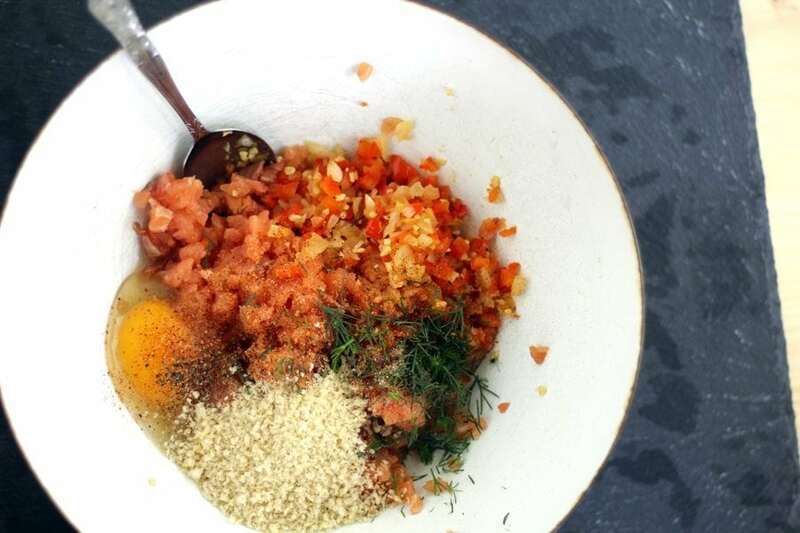 In a large bowl, combine the chopped salmon, pepper and onion mixture, egg, panko bread crumbs, fresh dill and seasonings. Stir to incorporate all ingredients. 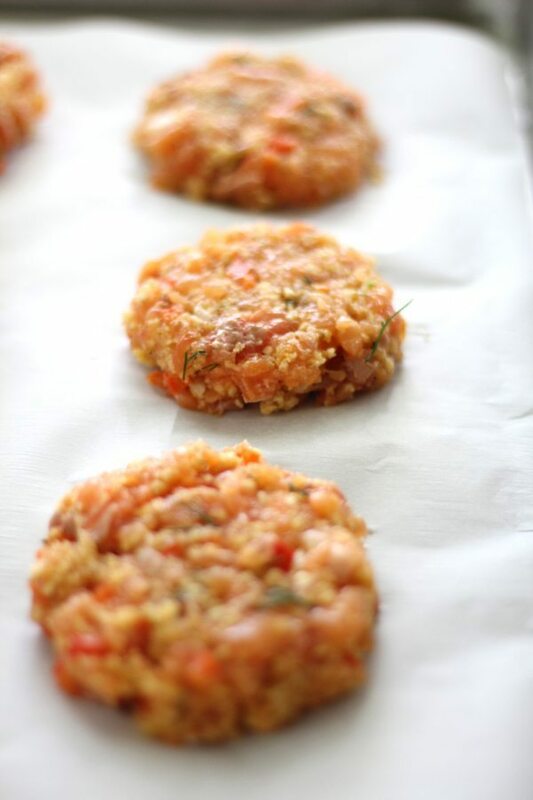 Form the salmon mixture into patties and place on a wax or parchment paper lined baking sheet. 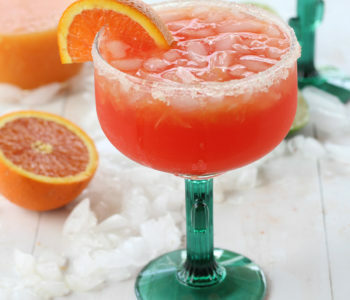 Refrigerate for atleast 1 hour. To cook, heat a clean grill to approximately 400 degrees. Oil the grill, and brush both sides of the chilled salmon patties lightly with olive oil. In a small bowl, stir together the mayo, dill, and seasonings. Squeeze the juice of one lemon wedge and stir well. 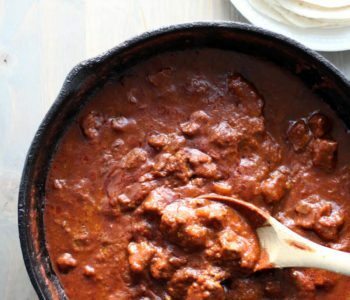 This recipe is easily doubled for a crowd or for meal prep. Refrigerate the lemon dill mayo leftovers. I could eat these all day everyday! They would make a perfect Father’s Day dinner too! 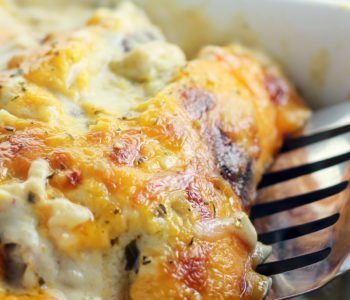 Great salmon recipe. I’ll be honest, I have never had a salmon cake made from the can :). I made once them from fresh salmon and they were delicious. Thanks for reminding me of that. I will use your recipe next time. These fish cakes look so delicious! 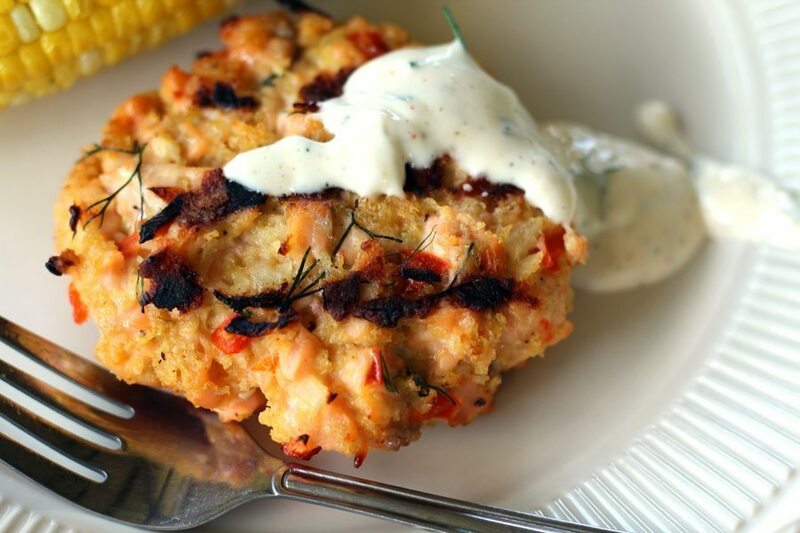 My favourite part is the dill mayo dressing, only makes these fish cakes taste better! Fresh salmon sounds so much better than canned, I bet these are delicious especially with that mayo!